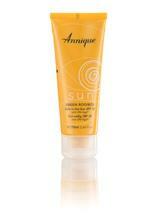 Make Annique Safe in the Sun with DNAge part of your daily skin care regime. It also contains Green Rooibos Extract. Not only is Green Rooibos anti-ageing; in recent research, it has shown great promise for protection against pigmentation and it may help prevent skin cancer when applied directly to the skin.